Special Offers for our 2019 Season! CHILI BAR RAFTING TRIP - Save up to 40% off our regular rate! The Chili Bar section of the South Fork American River is an excellent rafting run with many exciting class 3 rapids... a great choice for both beginner and experienced rafters. This 8 mile guided trip features wonderfully fun whitewater rapids. Its course will take you through beautiful Sierra foothill scenery, crystal clear pools and the small gold mining town of Coloma, CA. This is where James Marshall first discovered gold at Sutter's Mill in 1848 and started the California Gold Rush! The excitement comes to a head towards the end of our Chili Bar run with a popular rapid known as "Troublemaker" where you can pose for the videographers! 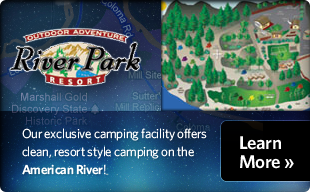 At the end of your trip, a chili dog lunch will be served at the gorgeous River Park Resort in Lotus, CA. Enjoy a cold beverage and view your exciting Go Pro videos at our River Store. At 1:30 PM, you will board the shuttle bus for a short ride back to your car.